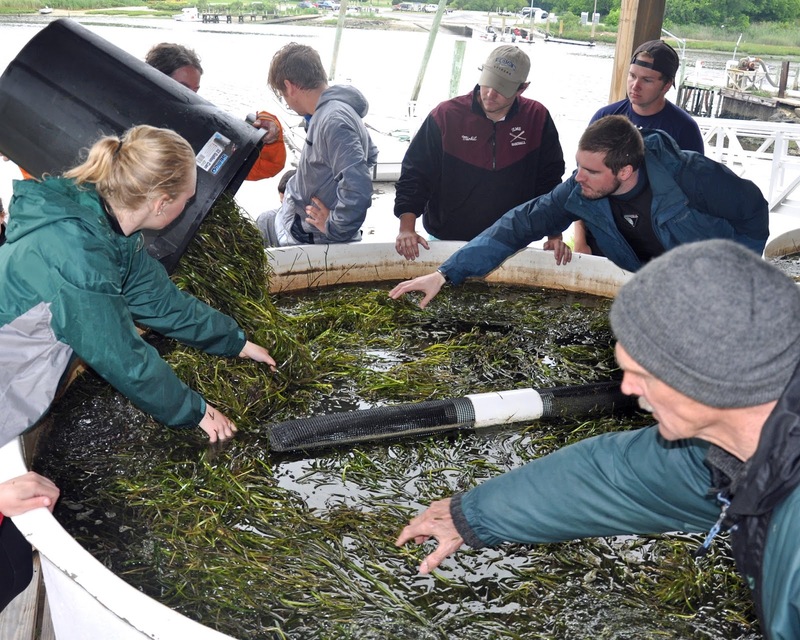 We recently participated in the largest seagrass restoration project in the world run by the Nature Conservancy and Virginia Institute of Marine Science. We were trained to identify and collect the seed bearing structures of eelgrass while snorkeling over thousands of acres of a lush underwater field of grass outside of Oyster, Virginia; to date the project has distributed over 70 million seeds! 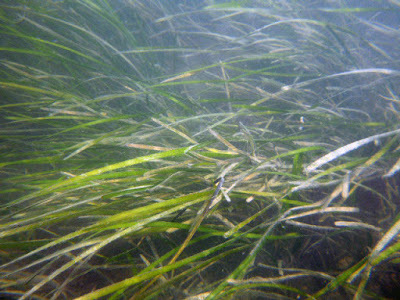 Sea grass meadows flourish in wide shallow expanses behind barrier islands and inlets that would ordinarily be mud flats. 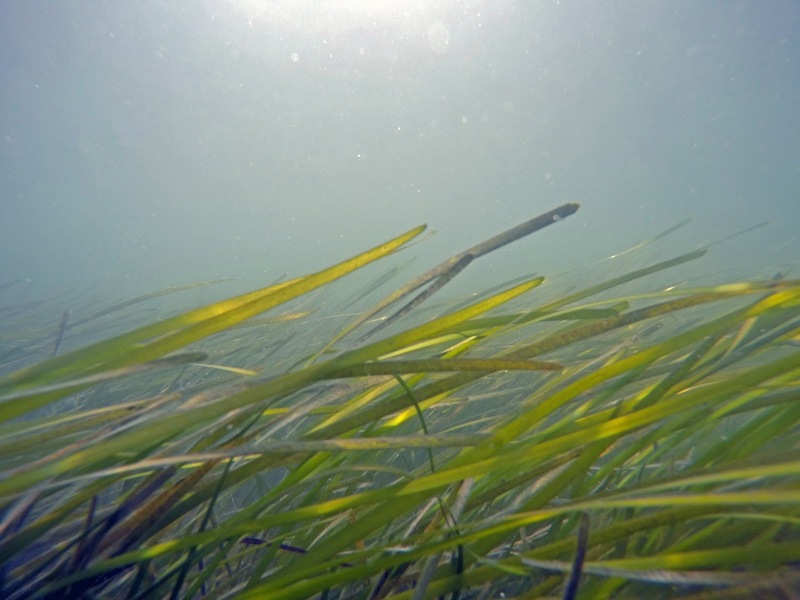 Once the grass gets established in large enough patches, their extensive root systems provide stability to the sediment, and the grass blades themselves act as a buffer against wave action by absorbing and diffusing wave energy. But most essentially, the grass becomes a complex habitat for a wide variety of invertebrates, crustaceans and larval fishes as well as food for a wide variety of waterfowl. The goal of the project is to restore wide swaths of original sea grass habitats that had been lost over the years due to disease, physical damage by hurricanes and poor water quality. 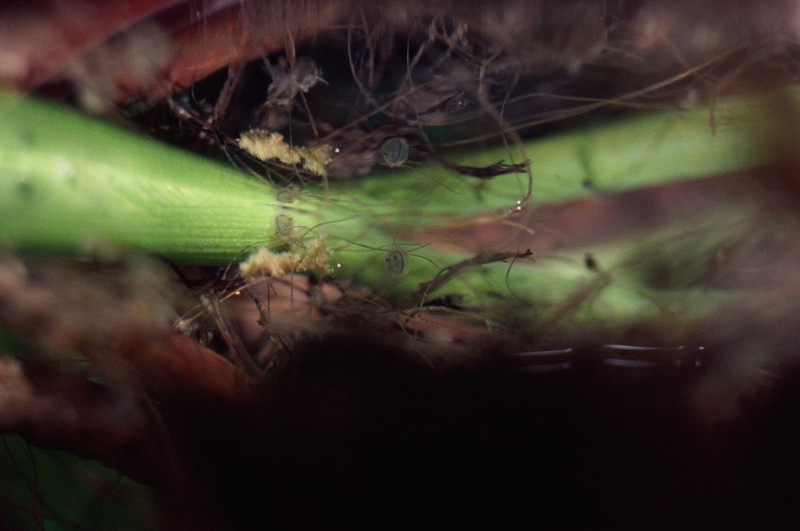 Excess nutrients and sediment run-off (the two major factors behind almost all of the Bay's problems) cloud the water which prevents adequate sunlight from reaching the plants and may also smother young shoots. 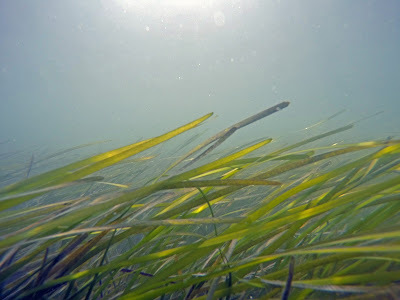 In areas with good water clarity, enough depth to keep the grasses submerged throughout the tidal cycles, the grasses can flourish, but they need the head start. That's what the project intends to accomplish. The Nature Conservancy trains and leads volunteers to collect and subsequently distribute as many seeds as possible. The first step in the project is where the volunteers (us) come in. 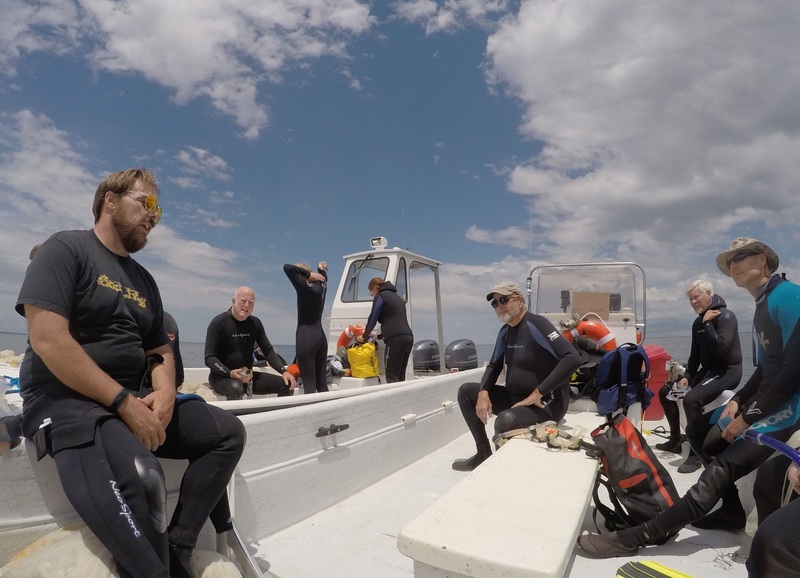 Around the last week of May each year, the Nature Conservancy schedules 5 rounds of collecting for approximately 15 volunteers to accompany their staff. 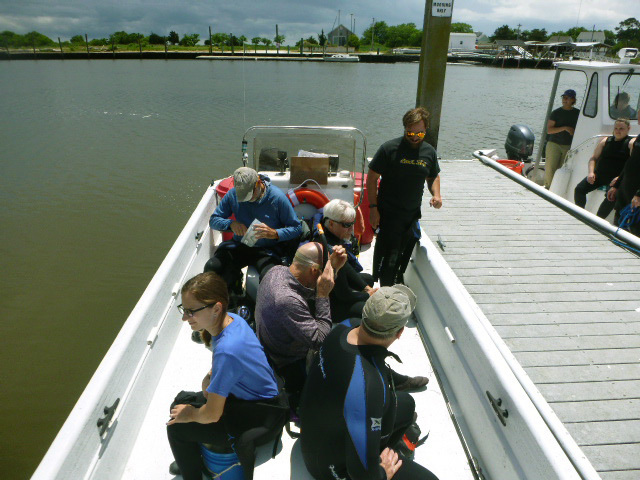 Two Carolina skiffs transport volunteers and crew out of the Oyster boat ramp to the grass beds in South Bay where the grass is flourishing. Snorkelers then pluck the seeded grass shoots and fill mesh bags for transport back to the aquaculture facility. For the three days of the five in which the weather held out, enough seeded grass was collected to fill twenty three 40 gallon trash bins! 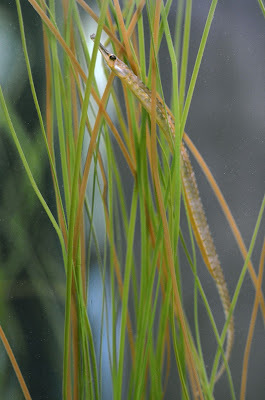 The seeds will subsequently ripen and fall out of suspension in the holding tanks where they are collected and then distributed over potential grass habitats. Hopefully they take root, and sprout into full-sized eel grass. 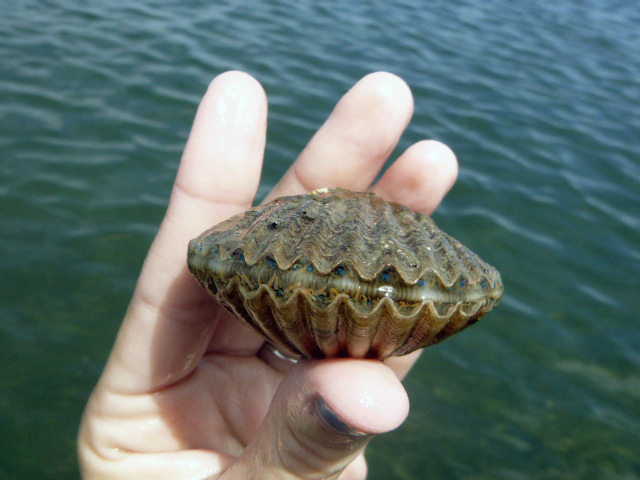 Patrycja even found a feisty bay scallop, which have been almost wiped out of the Chesapeake Bay and are slowly returning. 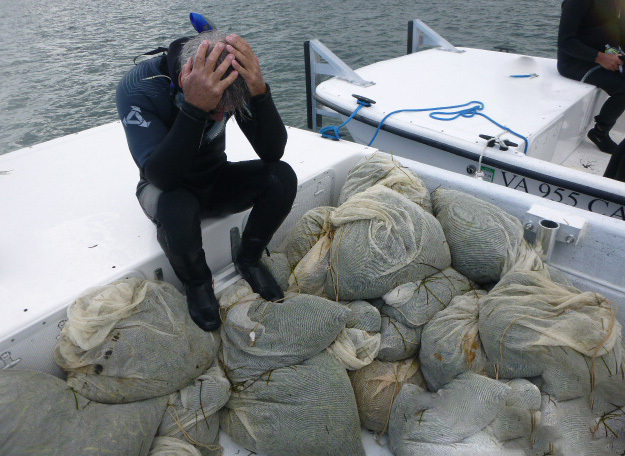 It's overwhelming how much seagrass (in the mesh bags) was collected in such a short time! 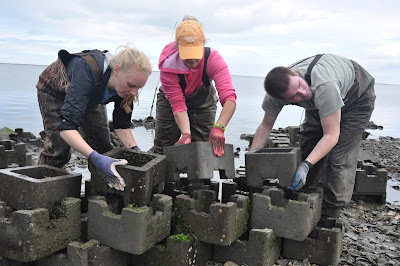 After collecting, the grass was measured and poured into large trough tanks on shore for cultivation. Judging by the expanse of eel grass over which we were snorkeling, the project is obviously working. 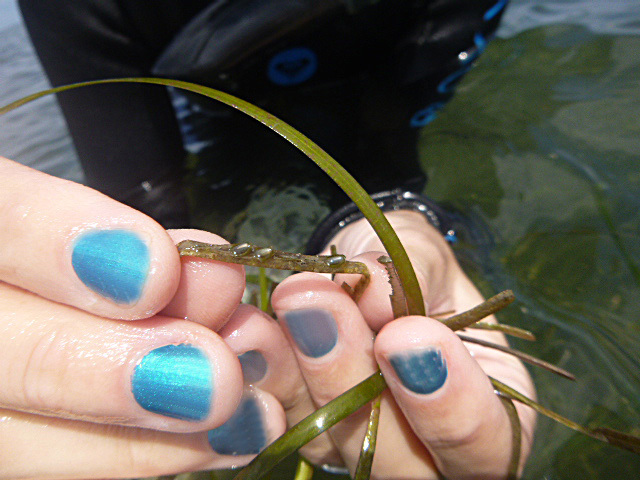 It's encouraging to imagine larger and larger expanses of eel grasses and the animals this ecosystem supports. 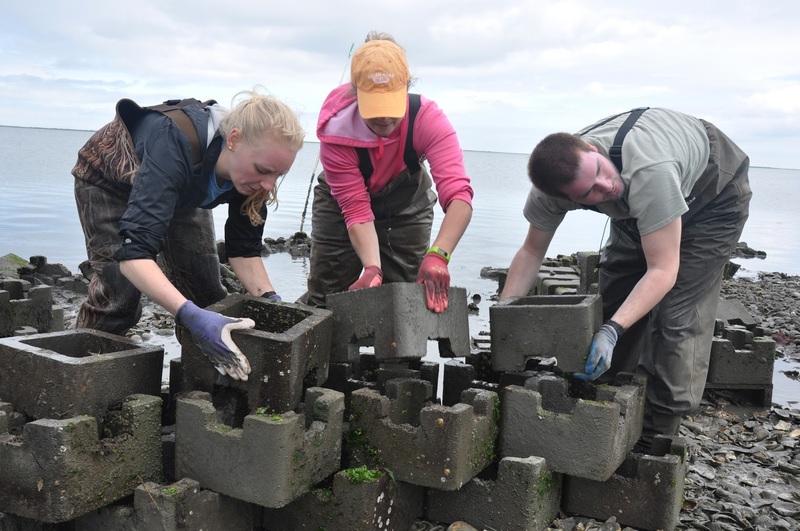 As with most conservation projects, it will take time, some luck and a lot of effort. We played our small part this year, but we eagerly look forward to helping out with an increased effort next year and swimming through those beautiful grass beds again. 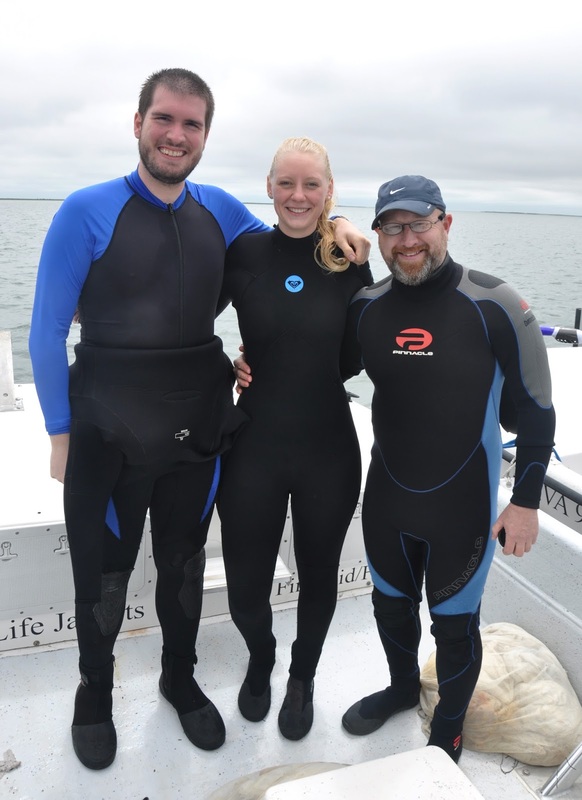 Jelly species fluctuate seasonally in Virginia waters due to their temperature tolerances and prey availability. The warmest months of the year feature the (stinging) sea nettle, the species many swimmers and beach goers are intimately familiar with. Adult sea nettles begin to show up in shallow creeks around May depending upon water temperatures and invade the beaches by mid June and are usually gone entirely by late September. Though sea nettles are relatively passive swimmers, they are still very effective predators. Sea nettles use stinging cells called nematocysts on their long trailing tentacles that fire off when contacted to ensnare and incapacitate small fishes and invertebrates, as evidenced by the the sting people may feel when coming in contact with their tentacles in the water. The sting is powerful enough for humans to feel, but only to be irritating, to small prey they are deadly. So it seems unusual that jellies would have other animals willing to swim in and among their tentacles, even ride on top of the jellies! 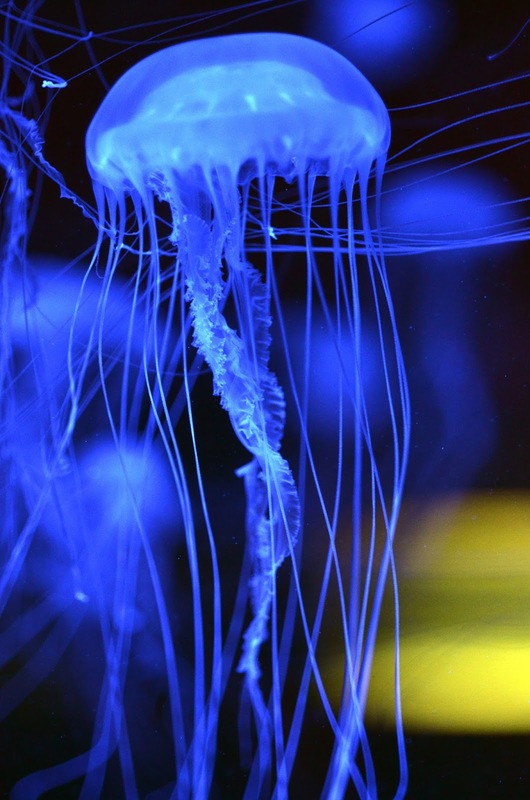 Yet there are fishes and invertebrates who use jellies to their advantage. 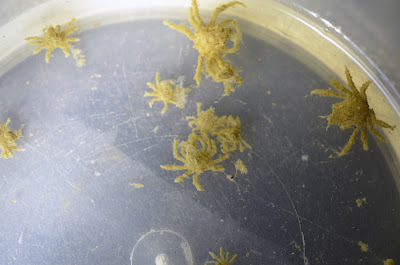 A significant percentage of the sea nettles we collected this year have had spider crabs in or on them, and the obvious question would be why? Or how did they get there? Spider crabs are known to ride on not only larger sea nettles but also cannonball jellies, another warm water jelly. They have been observed eating the jelly itself, but also picking at detritus the jelly may accumulate during its travels. 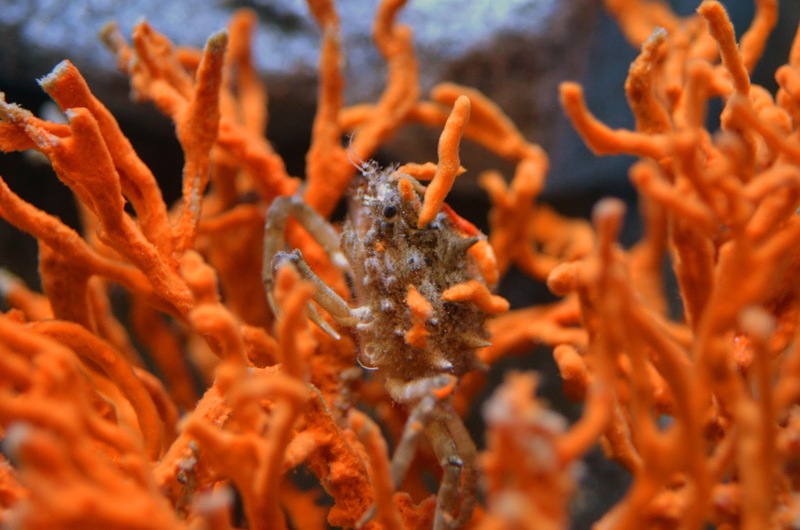 Spider crabs are opportunistic omnivores so the strategy makes sense, but spider crabs are bottom dwellers and cannot swim, so how do they get there? Spider crabs have zoae larvae, a planktonic swimming larvae which could easily latch on to a drifting jelly; an excellent refuge from predators, a mode of transportation, and a source of food. Spider crabs could also board their host jellies as fully formed, albeit tiny versions of the hard non-swimming form, through direct contact along the numerous bridges, piers, docks, pilings etc. where the spider crabs settle and grow and the jellies often pass against in their travels. Once they are on the jelly, they can hitch a free ride, feed and simply drop off whenever necessary. 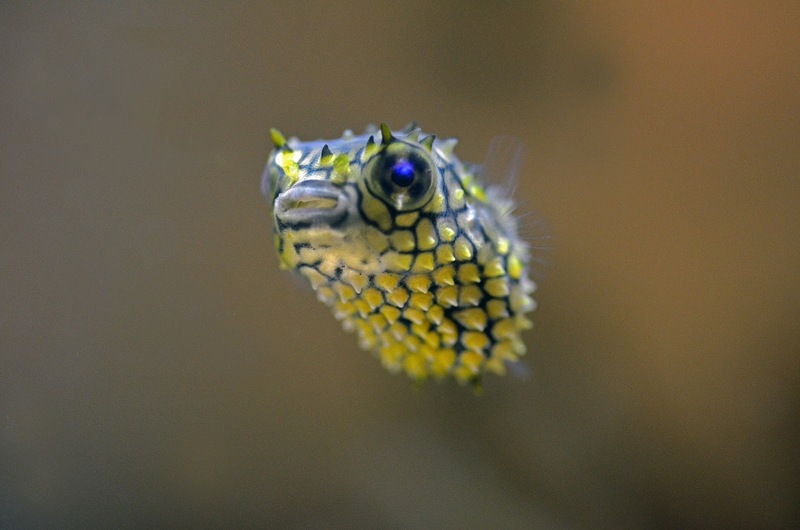 There are also fishes who also take advantage of jellies as floating food/shelter. We often witness harvestfish Peprilus alepidotus or closely related butterfish Peprilus triacanthus swimming among the nettles' tentacles. Both these species have a more obvious relationship with the jellies, they use the jellies for protection against larger predators and they eat the tentacles. 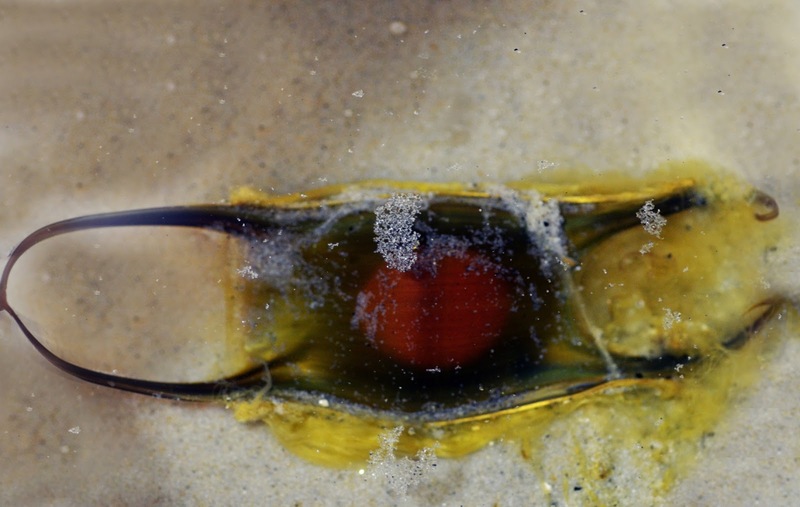 In both cases, the lowly jelly provides food and shelter for other species which may somewhat improve the image of a jellies being simply a pest. Chain dogfish Scyliorhinus retifer are more accurately catsharks, a large group of demersal sharks that have several characteristics not usually associated with "sharks": they spend most of their time resting still on the bottom because they are generally relatively poor swimmers; most are small (under 2 feet) and lay eggs in cases that look similar to those of skates, commonly called "mermaids' purses". 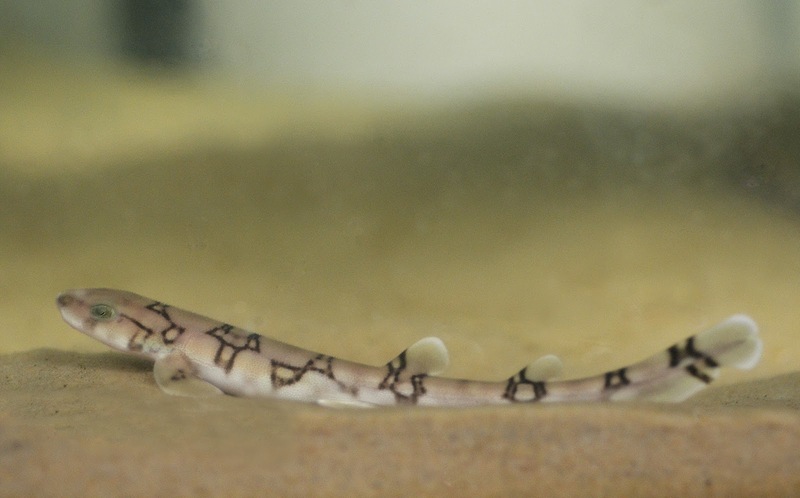 After an incubation period of about 9 months (here at the VLM) or up to a year depending upon water temperature, the young sharks emerge from the cases fully formed, as do skates. The mated pairs of chain dogfish are currently on exhibit and continually produce egg cases at a rate of about one every two weeks. 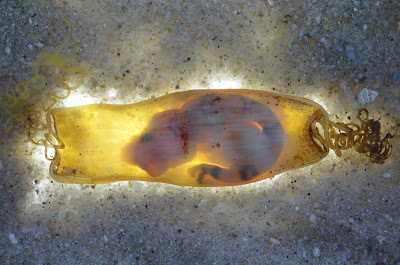 Females will wrap the tendrils of the egg cases around structure to anchor them during incubation, but it also helps her literally pull the case out of her body. In the exhibit, she expertly wraps the cases around a display box in which we display developing embryos. We will keep the juveniles in a holding system until they are large enough to display with the adults. 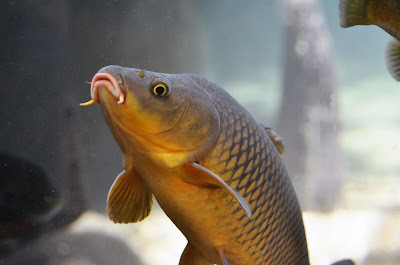 Common carp (Cyprinus carpio) were introduced to the US in the 1800's as a fast growing, highly adaptable food fish for the masses, but the enthusiasm for carp has since turned into disdain. They remain popular in their native Europe and Asia but in America they are now thought of as a nuisance, or technically a "non-native non-game species"; meaning carp are unwanted as food or sport. 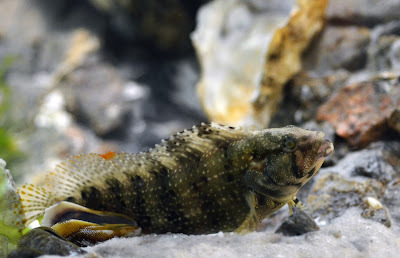 Carp gained blame and a reputation (undeserved) for degrading water quality by stirring sediment as well as the decline of game fishes by eating their eggs. Carp indeed forage in the mud and stir up, mainly because of their fondness for the aquatic vegetation in these areas. But carp are strongly associated with muddy, non-productive (from a fisherman's perspective) waters because: #1 they are often literally seen in the shallows and other fishes are not, and #2 they can thrive in conditions most species cannot, leading people to believe carp have elbowed out other fishes and muddied the waters. In fact carp are simply able to thrive where other fishes cannot. The irony of carp being thought of as the definitive "trash fish" is that their better known - literally mutant - version of carp is the koi; a fish that is revered, bred, painted, tattooed, kept as pets, and even sold for tens of thousands of dollars. The truth is that carp in any form are tough, smart and quite beautiful. 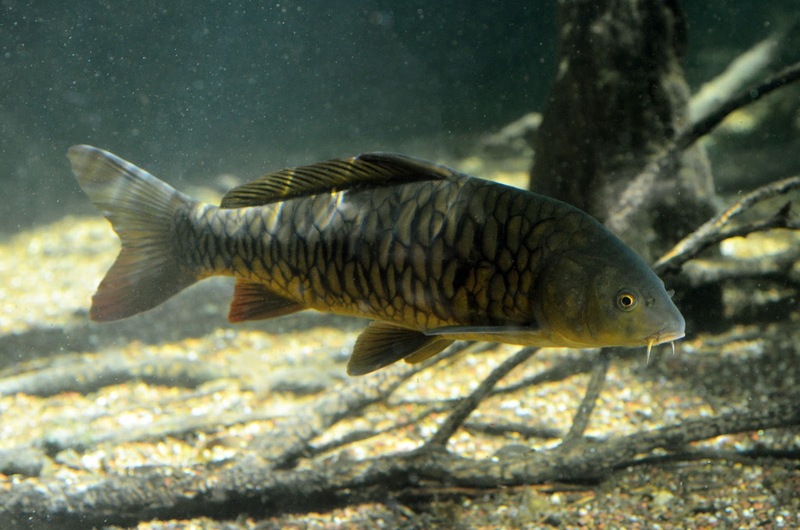 Wild common carp show natural variations, which led to their breeding to the koi variety that can be seen in local waters; irregular scale patterns, highly variable coloration, different body shapes, etc. We exhibit and raise wild local carp and appreciate their worth as an exhibit species and in our local waterways. Each spring we await their mini-migration up tributaries of the James River that lead them right into the heart of the suburbs and the city limits. Carp spawn in very shallow vegetated water and can be seen gathering in mass in late April in our area. Several males follow a larger female and they spawn against vegetation, on which the female lays adhesive eggs. We collect roots and vegetation covered with fertilized carp eggs to raise and display and or release, as we don't really need any more carp here. We simply place the vegetation with eggs in a mesh bag with some current flowing on them, then we wait. The eggs hatch very quickly, usually within a few days, and the fry generally end up escaping the bag - or we open it - and attach to the sides of the tank. They stay attached for less than a week and feed upon artemia nauplii and powdered spirulina flakes. The differences in growth rates within a cohort is remarkable; some baby carp may be ten to twenty times the size of their siblings. Whether we release them or display them for a while, carp are fascinating fish. They are survivors that challenge our core ideas of what is worthwhile and why - and who decides it. Looks matter, commercial worth (tastiness to humans) matters, perception is reality (and often mistaken), and attitudes change over time. In the meantime, carp are going to be here rooting around in the mud, and we'll raise them just for fun. 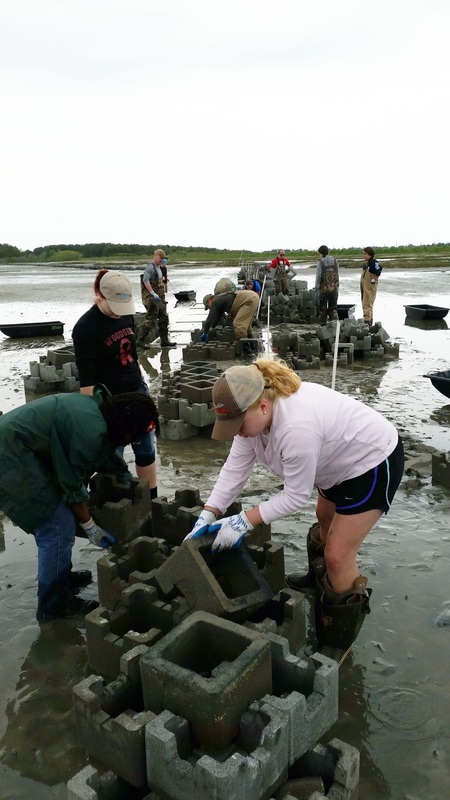 Several VLM staff members from three departments recently headed to Chincoteague over two day-long sessions in May to help the Nature Conservancy construct artificial oyster reefs out of concrete "castles". 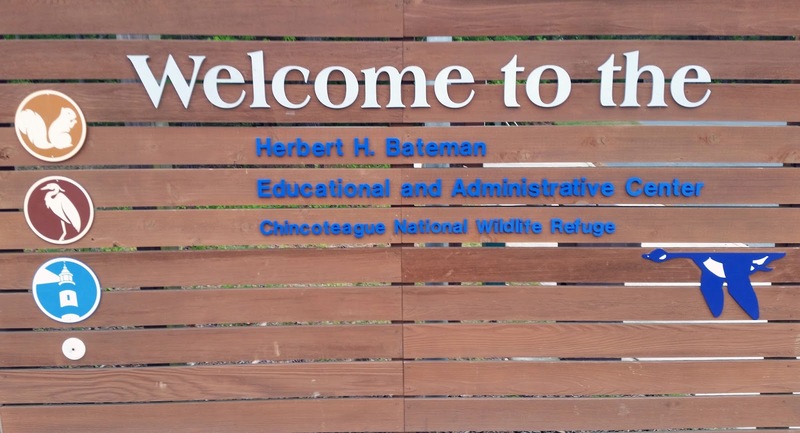 Staff and volunteers met at Chincoteague wild and beautiful USFWS National Wildlife Refuge on Virginia's Eastern Shore. 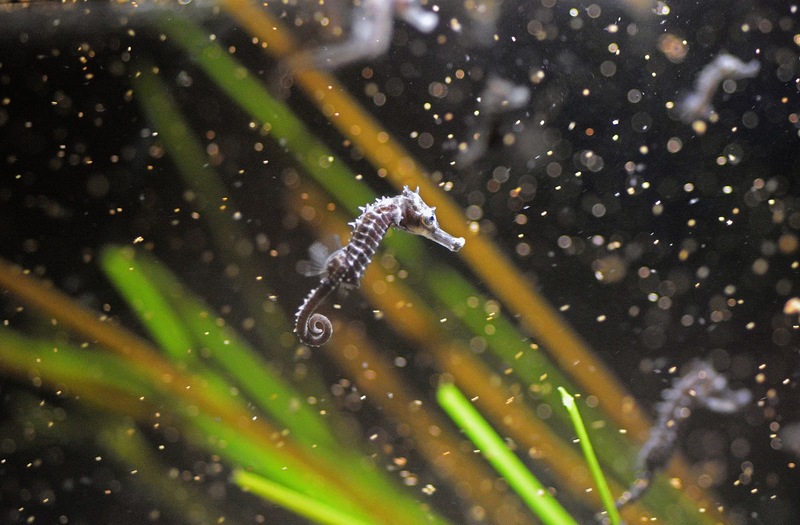 The area is best known for its wild ponies that roam free amid the dunes and low grasslands adjacent to the Atlantic Coast. 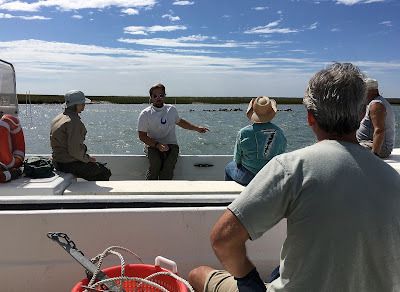 The shallow inlets within the refuge experience heavy tidal flow that provide rich waters and ideal conditions for oyster reefs. 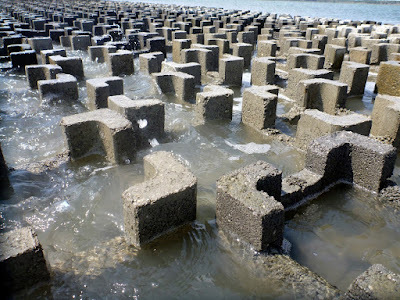 These reefs are constructed of tiered concrete blocks that are designed to be stacked and interlocked vertically into a pyramid-like structure (see below). 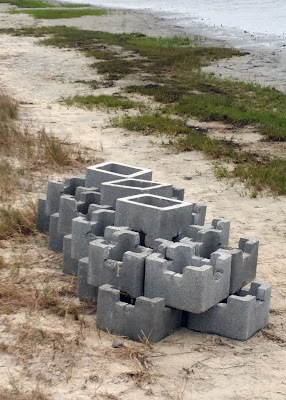 When these stacked blocks are oriented in a staggered horizontal line, they create a reef that acts as a breakwater to diffuse wave energy, trap sediment also allows plenty of hard surface for oyster spat to settle on preventing their possible burial. Before and after: First "castles" are left in piles in the inlet, then rearranged by volunteers into specific patterns, as well as long rows, for both stability and maximum oyster growth. The "castles" had to be towed around when the water was high. 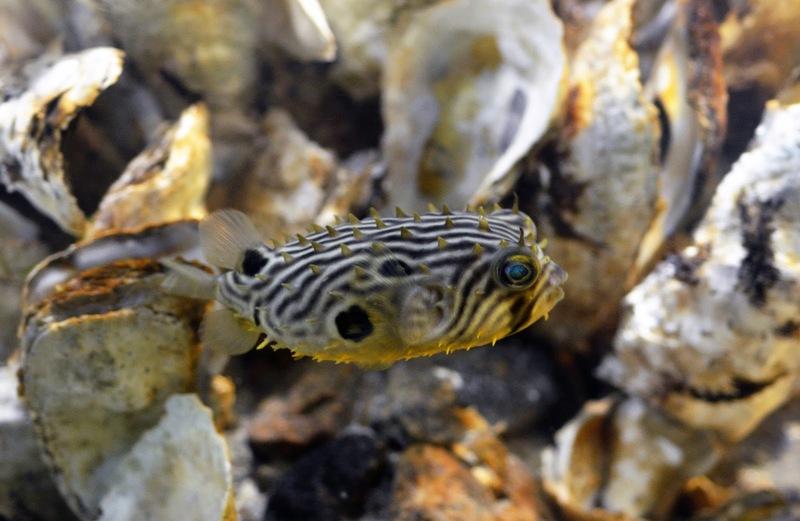 According to biotic surveys done on the reefs constructed last year with the assistance of the VLM aquarium staff, the reefs were deemed to be very successful and highly colonized, meaning lots of new oyster, fish, crabs and other inverts now call that reef home! 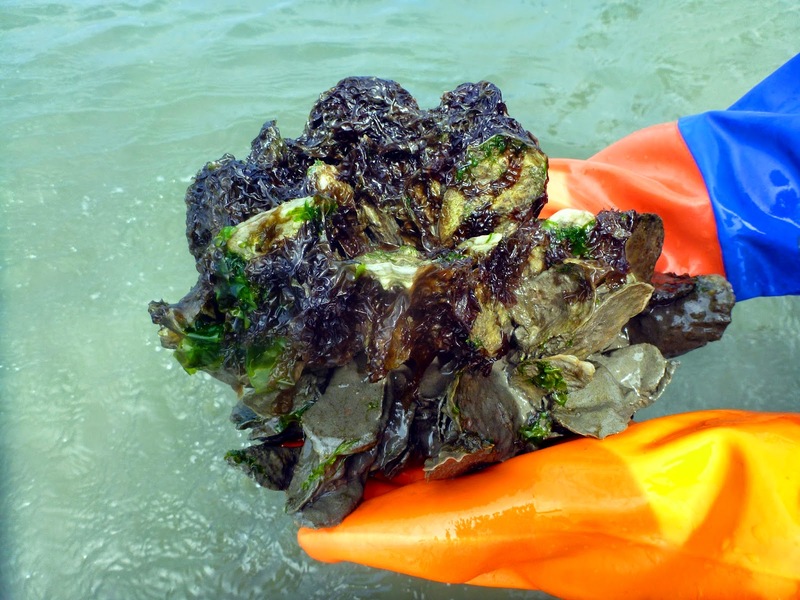 We have a live display of an artificial oyster reef on-site that exhibits live animals that inhabit healthy oyster reefs and provides information on the work being done by the Nature Conservancy and Christopher Newport University Professor Dr. Russ Burke. The efforts to provide a healthy habitat for wild oysters and the ever-growing oyster cultivation industry are helping to spur a slow but steady comeback by one of the Bay's iconic animals the American oyster. We display all three Virginia trout species: brook, brown and rainbow. Although brook trout Salvelinus fontinalis are the only native Virginia trout species (and our state fish), both rainbow trout Oncorhynchus mykiss (introduced from the western US) and brown trout Salmo trutta (introduced from Europe) have been in Virginia long enough (since mid 1800's) that they are now well established Virginians. 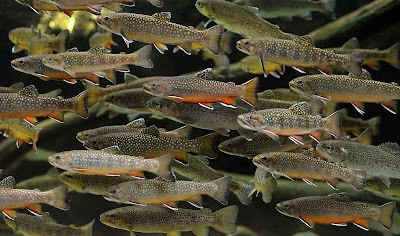 Though they are still actively stocked for sport in many rivers popular to anglers, rainbow and brown trout often out-compete native brook trout and may even prey upon them when they share the same habitat. In some cases, efforts are underway to remove non-native trout and restore habitat of the wild brook trout. From a husbandry standpoint each species has its own behavioral characteristics. 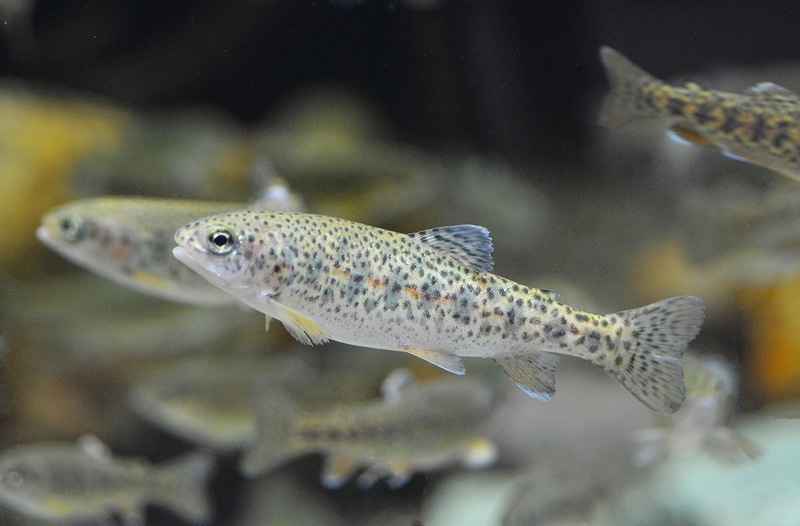 Brooks are the easiest to keep; they are disease resistant, readily spawn in captivity, and are the most peaceful with each other and the other trouts. 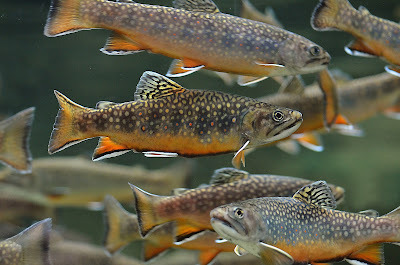 Brook trout are also strikingly beautiful, making them an excellent display species. Rainbows are simply eating machines: given the opportunity rainbows will eat until they can barely swim. 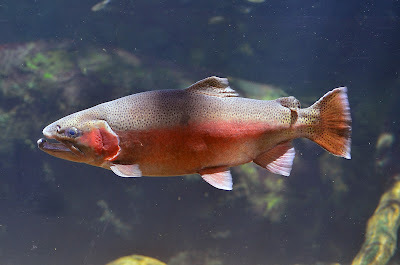 Rainbows also tend to have more health issues than any native species we rear; they have long been captive bred for distribution throughout the the US and the world - for sport and for food - a factor that has made captive strains considerably less hardy. Aside from the fact that they are susceptible to disease, they are generally easy to keep as well. Browns are the outlier of the three. They aren't as overtly colorful as brooks, as well known as rainbows and may vary widely in color and patterning: some browns are vivid gold with a plethora of black spots all over their bodies, while others may be drab olive-brown with little spotting. Regardless of their physical appearance browns have charisma. Thought to be the hardest to catch in the wild of the three trout species, they are the most reclusive and seemingly least tame. 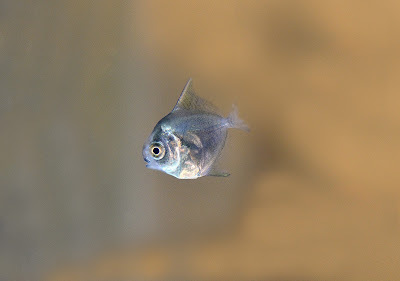 Browns have a tendency to hide, lay motionless much more frequently than brooks or rainbows, and will eat surprisingly large tank mates. And they jump! - out of the exhibit and sometimes into another. 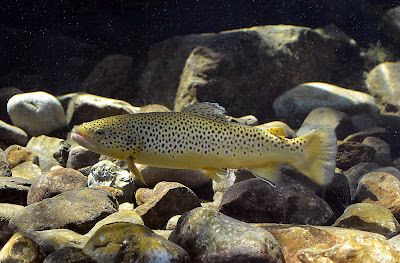 Several times overnight a brown trout has leaped into the Mountain Stream exhibit where they are found in the morning among the smaller stream fishes. Thus they require barriers to keep them from leaping onto the floor overnight. Did I mention browns are most active at night? View from Spy Rock a peak on the Appalachian Trail, accessed on Hatchery Road. A side tributary of the Tye River, many of which are wild brook trout streams. 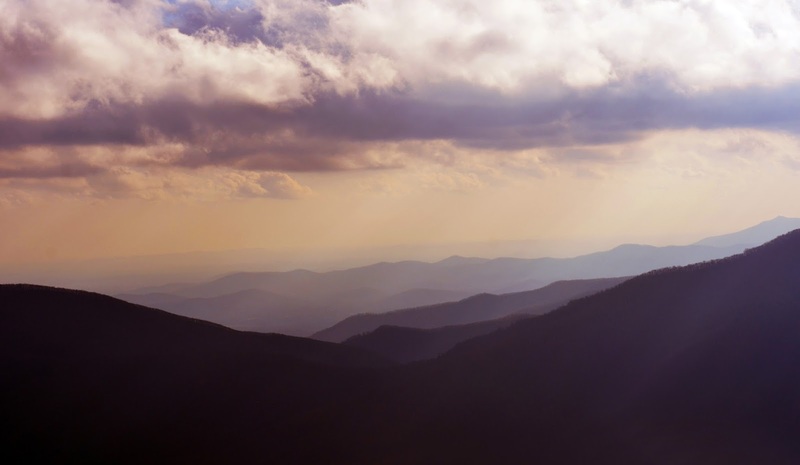 Montebello Hatchery is located just a few miles past Crabtree Falls (Tye River) and is also the access point to a hiking trail spur leading to Spy Rock on the Appalachian Trail. 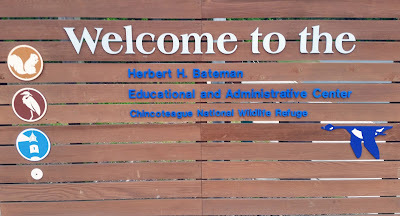 It is a beautiful area and the facility is open to the public. This hatchery raises all three species of trout and generously gives us fingerling trout when we need them. This visit we only needed only rainbows, with plenty of brooks and browns currently on exhibit. Below is a video of the rainbow trout fingerlings at the hatchery; we brought back about 200 of these guys!